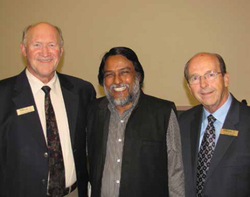 The annual Far East Broadcasting Banquet in Wetaskiwin celebrated 50 years as a Canadian organization; brought news that Bob Bowman, founder of FEB Radio International in 1945, had passed away on March 12, four days before his 99th birthday; and told of the ongoing work, conditions, risks, and successes. Rev. Klaus Tonn, Regional Director for FEB Canada, was MC for the evening and provided a wide range of information about FEB. Team member, Peter Martens, was host and talented vocalist. The speaker, Rev. A. C. Benjamin, FEB Director for India, shared many aspects of his work, along with a few jokes. Far East Broadcasting Associates of Canada was incorporated in B.C. on April 8th, 1964 as an interdenominational, non-profit organization and member of FEB International. For over 50 years FEB Canada has provided a means for Canadian Christians to help through prayer, financial assistance, and volunteering to reach beyond economic, educational, geographic, political, and religious barriers with the Gospel of Jesus Christ. Today nearly two thirds of the world’s people are potential listeners to some of the more than 700 hours of programming produced daily and broadcast in more than 130 languages over 128 stations and/or transmitters. FEB Radio International owns and operates 42 stations and/or transmitters and is adopting new technologies such as internet and satellite broadcasting, podcasting, MP3 players, cell phones, memory cards, and speaker boxes to inform the world of the Good News of Jesus Christ. In spite of the fact that many of the broadcasts and other communications reach into areas where it is very dangerous and/or illegal to become a Christian, in 2012 there were 1.9 million responses from listeners. FEB Radio International has a number of strengths. One is that most of the staff, including those who write, record, and host programs, are nationals working in their own language and culture. Another strength is the range of programming, including, Bible studies, preaching, teaching, music, counselling, and live call-in, which introduce listeners to Christ and also encourage them, help them to grow as disciples, and train as leaders. In the wake of disasters, FEB Broadcasting promptly brings in a First Response Radio team with a portable radio station and wind-up and battery-operated radios for distribution to facilitate communication of sources of food and medical aid, accommodations, government instructions and hope to the survivors. FEB also works in partnership with many other Christian organizations. Those who work for FEB also often choose to volunteer with other ministries in their areas. Radio, and related technologies, are the most efficient means of making the Gospel message available to every person, especially to non-readers and those trapped in areas opposed to Christ. FEB is one of three major Christian radio missions to the world, and together they cover the globe. They believe that Christianity is true and therefore every person needs to hear the Gospel, and are dedicated to making that possible.